Hundreds of people spend hundreds of dollars on cigarettes on a monthly basis, and when they get tired of smoking they may spend hundreds more on nicotine patches and pills and gum and herbal supplements trying to get themselves to quit—to no avail. The following NLP process will teach you to quit smoking without spending a dime by “reprogramming” your mental process using mental images. It’s important to realize that the chemical component of a cigarette is only a single part of the addiction. A smoker learns to relieve stress and boredom by smoking, and to expect instant gratification by way of the act of smoking, and fills the spaces in his or her day with smoke breaks until it feels as natural to them as breathing, and quitting feels as unnatural as suddenly having to hold your breath indefinitely. In order to combat the psychological need for a cigarette, the trick is to learn more about your mental processes when it comes to smoking, and to alter those mental processes in order to alter your behavior by extension. That is where the “Swish” pattern for smoking cessation comes in. Take the following steps to bring yourself that much closer to being done with smoking for good. In order to use the “swish” pattern to quit smoking, you must first discover the thought, feeling or other sensation that initially triggers your urge to smoke. Perhaps it is imagining that you can smell the smoke, a tingling in your hand, or even imagining yourself relaxing and smoking. Try and find the very first thing that sets off the chain reaction of events that leads to you lighting up. If it is a smell, a sound or any other non-visual sensation, make a mental picture that you associate with that sensation. Once you have decided upon an image that represents the first thing you see or feel or taste that leads to your lighting up a cigarette and pictured it clearly in your mind’s eye, choose an image to replace that image—preferably an image that will make you feel strong and lessen your desire to smoke. For example, you could picture the most beautiful thing you will gain by no longer smoking, such as your own health and the health of those around you, whether it be pets, children or your significant other. It is important that you place yourself within the picture, creating what is called a “dissociated” image. This type of image allows you to see yourself from outside yourself, having already achieved your goals. An image in which you can see yourself is also more interesting and memorable to your own mind than an image in which you are absent. Close your eyes and visualize the image you chose to represent the feeling or thought you have that initially leads to lighting up a cigarette, and make it big and bright in the front and center of your mind’s eye. At the same time, visualize the image you chose to replace the former image at the bottom left hand corner of your eye and make it comparatively small and dark. When you have both images clearly visible in your mind’s eye, one big and bright and central and the other small and dark at the bottom left hand corner of your “vision,” give yourself the cue to switch the images by saying the word “swish” aloud. Saying the word “swish “ gives the mental switch a more physical, felt quality which can make it more concrete and real for the mind. As you say “swish,” watch the image from the left hand corner drift to the center and grow and brighten while the central image simultaneously darkens and shrinks into the corner. Once you have completed the above steps, you “clear” the now rearranged mental pictures from your mind’s eye and start over, placing the first image brightly in the center and the second image small and dark in the left hand corner, just as you did when you started, and when you have them clear in your mind, say “swish” and switch the images. Practise doing this until the point so when you try to call the first image to mind, the second image appears instead. If you are able to get this process to work for you, a picture representing the positive thoughts and feelings associated with the best reason you have not to smoke should appear in your mind rather than the catalyst thought or sensation that used to lead to your perceived “need” for a cigarette. If performing the process on yourself doesn’t work for you, perform it on someone else and have them return the favor, as external assistance will often strengthen your results. About the Author: Ryan Rivera is a firm supporter of alternative methods to relieve anxiety and stress, and tells everyone he works with that reducing smoking is a great place to start. 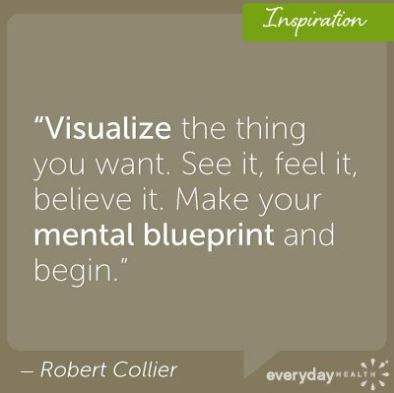 Have you designed your own mental blueprint? Are you aware that you have a ‘blueprint’ in your subconsciousness mind that you may not have designed? This ‘blueprint’ can influence all areas of your life from finances, relationships, business or work, health and love. 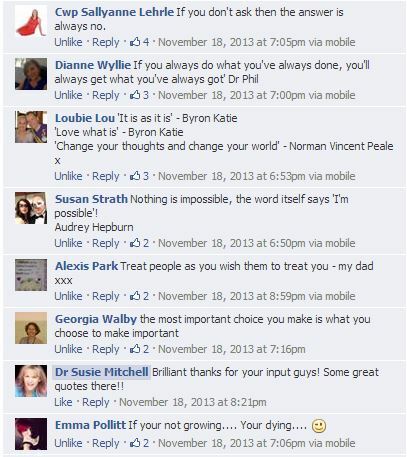 In fact all aspects of your life are influenced by your ‘blueprint’! Your ‘blueprint’ is created from your childhood, how you were raised, the school you went to, the friends you made, all of these influences have created your mental blueprint. If you are not happy with the current results in your life the good news is this blueprint can be changed! The first step is to recognise that this blueprint exists! You can design your own life, whatever that looks like. It’s your life, it’s your dreams, its your plan! Make sure it’s by your design not others! The journey begins by determining what it is you most desire and every journey requires preparation. You will need to focus on connecting with all aspects of YOU – your physical, mental, emotional and spiritual side, and learn how to overcome obstacles – such as unproductive beliefs and emotions. What kind of life do you want and how close are you to living it? Choices in life are a balancing act. We can all choose to do certain things everyday of our lives. Focus on what’s important in life and make positive changes to make you happy, we have to see life as an adventure! Change your thinking and step outside of yourself. You need to create a blueprint which nails down just what you want your life to look like. I have mentioned on the blog before about taking the ‘rocking chair test’, when you look back on your life when you are 90 years old what will be your legacy? Each of us possess the will to create our own legacy. It’s all about a choice. Create the power to live the life of your choosing. Changing your mind about anything is work. The realization that you CAN change your mind—and therefore your life—is the start. This is not magical thinking, but science—neuroplasticity. New neural pathways are formed in your brain as you change your habitual thoughts, language, and feelings from fear to freedom. So quiet your doubting mind, try something new, and see what transpires. If you would like some help on creating a new mental blueprint join my webinar series launching on 3rd February. This will be a six part series focusing on all the skills and techniques you need to create your own life. Available to order now. I am excited to be launching a six part webinar series “Creating an outstanding mental Blueprint”. This is the first time I have run a series of webinars so it will be great to connect with so many more people where location is no barrier!! Dr Susie Mitchell is a Psycho-Neurologist, Professional Coach and Master Practitioner in NLP, Hypnotherapy and Time Line Therapy. Susie is the author of ‘Satnav for the Soul‘and ‘The S word’, writes for newspapers and magazines, has appeared on TV and Radio and is a motivational and a keynote speaker. Susie has built two successful businesses and loves working with people. For us to truly excel at many areas of our lives, we need to make dramatic internal shifts, to fulfil our dreams and ambitions. Susie gets outstanding results with her Corporate Coaching and Personal Development clients from all types of backgrounds. Susie now brings to you a six part webinar series that will give you the best ‘mental blueprint ‘to overcome life’s challenges and create the life that you desire. Through this series you will be guided through processes and techniques to enable your mind-set to the freedom to thrive. This weekly webinar series will be delivered to you over six weeks every Monday at 8pm beginning February 3rd. You will be emailed an exclusive link 24 hours before each webinar. All webinars in the series will be recorded and made available to you. After each session you will have the opportunity to submit questions that will be followed up the following week allowing you to get the most value from this series. If you need more information, please do get in touch through Eventbrite or my Facebook page! In the words of the great Jim Rohn “Work harder on yourself than you do on your job”. I will let him explain! 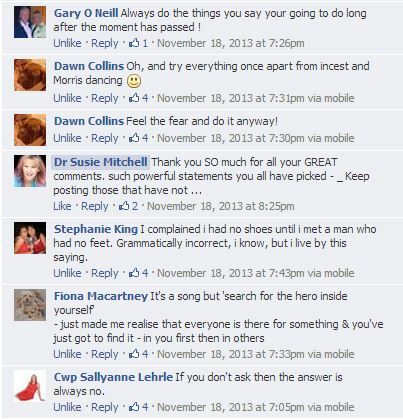 I asked this question recently on my Facebook page and the response was fantastic. It seems we can all be inspired by quotes and sayings that resonate with us, we tend to hold on to these quotes and use them as mantra’s for our own life. Quotes are a way of life – they permeate the world with compartmentalized mantras that are the values, wisdom, and ideals of many. Quotes make it easier for us to convey our values to others, we all want to communicate with others and be understood, quotes are a great way to put our thoughts into bite-size pieces. Quotes can come from great leaders, books, films or songs, they can make us re-access our lifestyles, provide us with inspiration or make us reflect. I recommend you record the great quotes that you hear, make sure you write down your favourite quotes and look at them everyday, you will be amazed at motivation they can provide! Leave your favourite phrases of quotes in the comments below. 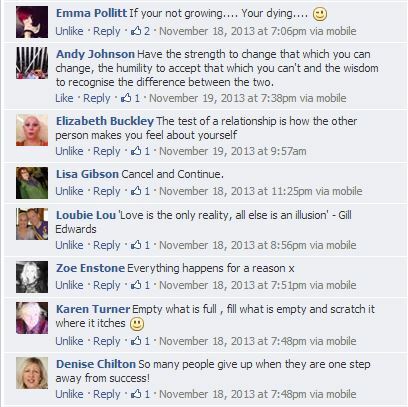 Read through the Facebook comments, you might find one that resonates with you!